American MORE! 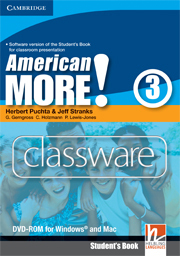 Classware offers you an exciting way to use the Student's Book material in class. Whether you've got a computer and projector or an interactive whiteboard, this classroom software facilitates 'heads-up' learning, encouraging your students to interact even more with each other and with their learning material. As well as containing all of the lessons from the Student's Book and the class listenings plus audio scripts, this Classware also includes a phoneme chart and pop-up dictionary. The American MORE! Classware also features comprehensive teacher's tips to make sure you get the most out of this classroom software. 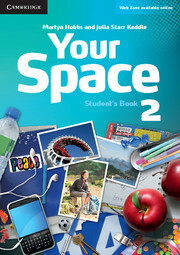 Your Space is a three-level course designed to motivate students as they change and grow.